One of the things I really like about Clapton is that he is a phenomenal performer. Listen to the track ‘Pretending’ on 24 nights live (1991), disc 2. Turn it up loud, and you can feel what a blast he and his band were creating the nights of these recordings. He always has a fantastic band, and is himself a first class singer. Some people still expect him to be inventing great new riffs, or to still be ‘Clapton… is god’. My feeling is that he has become seriously steeped in the blues and of course music in general, and continues to investigate it more deeply. That means making it more like a second language, rather than trying to invent Jimmy Page killer riffs every album. Not many people try to seriously attack Robert Johnson’s portfolio for example (guitarists out there know how hard Johnson is to play – and to ‘get’). Nor do they get on stage and play for a couple minutes with J J Cale, before realising that they are playing After Midnight, one of Cale’s most famous songs, made even more famous by Clapton’s classic cover (recounted in a documentary on Cale from 2007). As he said, JJ is a total minimalist, while he (Clapton) likes to play a lot of notes. Side note: it is hard to go past J.J. Cale at least in the blues/rock genre for choice of notes and space… can anyone beat him? What can we say about Eric Clapton in 2010? Although his performance with Jeff was more comfortable than mesmerising, I think he is still one of the handful of absolutely consummate performers. Unlike the Rolling Stones or any other 60’s great playing in their latter years, any song on stage by Clapton and his band is immaculate, perfect timing, full of energy, sung and played to perfection. I think it’s hard to realise how good he is because at this point, he is wearing his music like a second skin. Great songs in his set on the night: I shot the Sheriff (and I am not a big fan of this song), Cocaine (a real hard rock meltdown version), and one of my all-time favourites, Tell the Truth (live in 2008 this one). 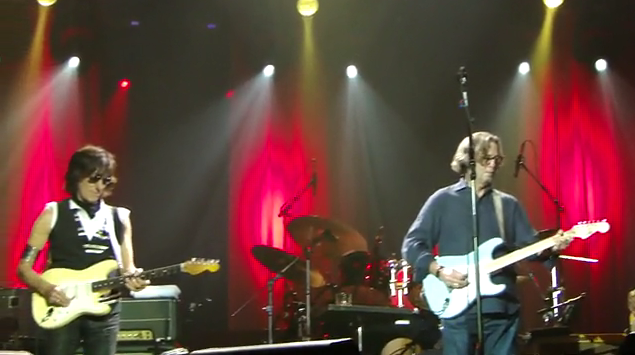 Recommended other stuff: Clapton + Winwood at Clapton’s 2007 Crossroads bash, playing ‘Can’t find my way home’. Find it on youtube and elsewhere. What the?!?!?! No matter how many times I hear a Jeff beck record, video, or now (finally) get to see him, I can’t believe the things he is doing to the guitar. The reason I decided to put up some musings about ‘the guitar’ was due to seeing Clapton and Beck play together, because of their radically different styles. Jeff Beck is often called a ‘guitarist’s guitarist’. That’s not really true; the only limiting thing about Beck is that he doesn’t often bother with compositions that include vocals, which in the mainstream pop/rock market certainly reduces the audience. He doesn’t seem to care. But for musicians of any kind, especially guitarists, seeing and hearing him is a joy. He cares about individual notes, and turns them into emotive force. Listen to a day in the life (live). If you want sheer energy, try Big Block (live at Ronnie Scott’s), off his classic 1989 Guitar Shop record. I read a review recently that criticised Jeff for going on stage looking the same as he has since the 1960s (which is true; the old style haircut, same sleeveless top as ever). This is the kind of comment from a person with no ability to actually hear what Beck is doing. It wouldn’t matter if he was in a wheelchair. For another feel for his music these days, try Seasons of the album ‘Jeff’. In the O2 concert with Clapton he performed many of his modern classics. One had me mystified for 20 seconds, until I realised it was Nessun Dorma, not exactly his usual repertoire! For me, as someone who plays guitar (somewhat;-) and has an ear for guitar, what I love about Jeff Beck is that he is still making new sounds, I mean in the sense of what actually comes out the speakers. Not many people can do this, and Beck is mostly doing it with the guitar itself. How he physically plays the thing is something to see (not just the whammy bar), and as any of his legion guitar-playing fans know, much of what he does is really hard to reproduce. On the pieces they played together at the O2…. what really amazed me was to see two legends of rock play together with absolutely different stylistic approaches, and yet completely seamlessly. You might say, ‘of course, they are professionals, what else?’ But any guitarist watching this would have realised that mixing solos and rhythm the way they did is no mean feat. I don’t know how much they practice together, but the ‘together’ part of the gig was not just a token, it was for real. Sure Clapton and Beck go way back, but that doesn’t take away from the joy, and especially the amusement of seeing Beck play lead for Clapton. But…. why the need for Hi Ho Silver Lining as the encore? Apparently the Brits love it, and there is no escaping the song at Christmas time in this country apparently. May they keep going forever (and Steve Winwood too – check out this version of Dear Mr Fantasy). Coming soon… Paco de Lucia, Paco Peña, Mark Knopfler, John Scofield, Alan Holdsworth, Clarence Gatemouth Brown, B B King, Dave Gilmour, Ritchie Blackmore, Jeff Healey, Hadrien Feraud and a couple of exceptions to the ‘seen it live rule including Iron Maiden/Bruce Dickenson, and Jan Akkerman, as well as some amazing young youtube crazies. This entry was posted in Culture, Guitar files and tagged beck, clapton, guitar by wolandscat. Bookmark the permalink. Though I’m a big fan of all of those guitarists, for me it’s John Petrucci who does it for me. Take a look at Damage control or Glasgow Kiss, then move on to some of his work with Dream Theater(particularly the Systematic Chaos album). I’ve seen John Petrucci with and without Dream Theater, and I believe he’s one of the most technically gifted guitarists on the planet. But I realise that doesn’t always translate into musical quality. Steve Morse is the same – can do anything (maybe not some flamenco tricks), but … when you listen to Blackmore’s nicely constructed playing on many DP songs, SM doesn’t quite capture the feel or taste of it. 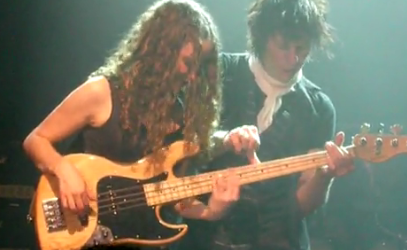 Another couple of young Aussies to look out for…Tal Wilkenfeld and Joe Robinson. Tal is a young base player who played with Jeff Beck and Chik Corea. Very talented. I recently saw Australia’s got talent winner Joe Robinson and his trio, put on a remarkable show of finger picking acoustic guitar. He has a lot of his music on youtube. Very much the up and coming successor to Tommy Emmanuel.